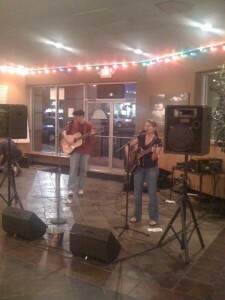 Here is a photo of Deanna Rene playing Wednesday night at Hangtown’s Neighborhood Music Night. It is like an open mike night only the bands must be pre-approved by Danny Prater. Danny is the event’s organizer. Deanna and her partner were a delight. Along with the free music, Hangtown offers $2 beers, $3 hamburgers, and $7 large pizzas with 2 toppings at the Wednesday night event. If you are a musician and interested in playing at their next Wednesday nighter, contact Danny at 450-1167.